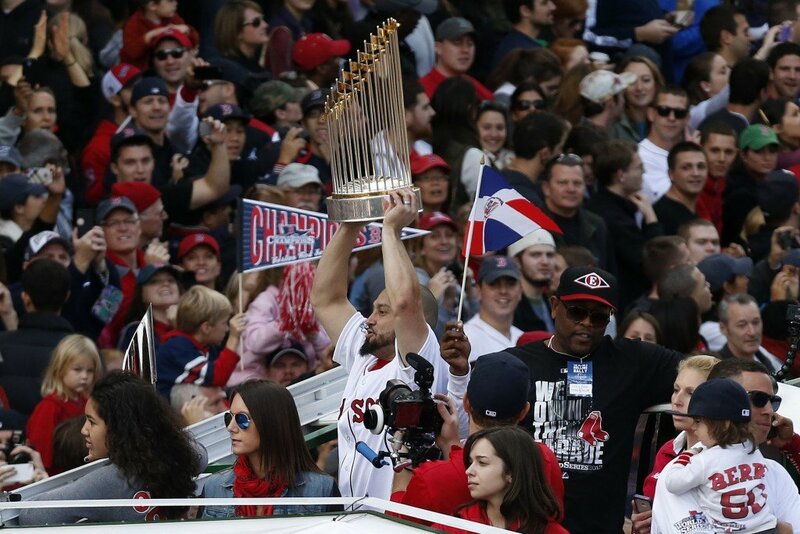 The Red Sox celebrate their World Series title with a ‘rolling rally’ through Boston. BOSTON — From the Green Monster to the Charles River, the bearded champions celebrated their improbable journey with another familiar sight in Boston. For the third time in 10 years, the Red Sox carried the prize through their city in a “rolling rally” of amphibious “duck boats” as thousands of fans lined the streets and the banks of the waterway that separates Boston from Cambridge. The most poignant moment occurred early in Saturday’s trip when the vehicles stopped at the Boston Marathon finish line, near where two explosions killed three spectators at the race on April 15. 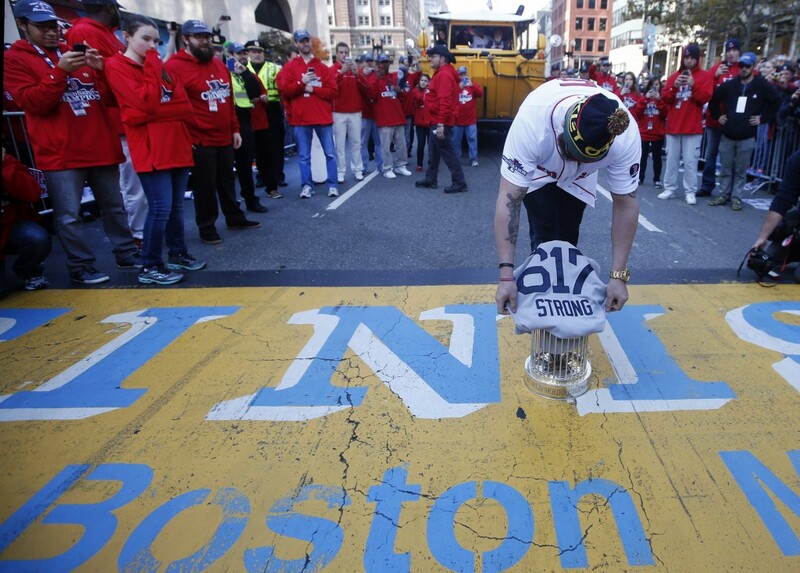 Outfielder Jonny Gomes placed the trophy on the line and he and catcher Jarrod Saltalamacchia held Red Sox jerseys with the words “BOSTON STRONG” and the number 617, the city’s area code. A jersey with that message hung in the Red Sox dugout throughout the season after the bombings. On a mild, sunny day, noted tenor Ronan Tynan sang “God Bless America” and the crowd joined in. Before the rally began at Fenway, Manager John Farrell recalled that the Red Sox had left after their 3-2 win over the Tampa Bay Rays the day of the Marathon for Logan Airport for a trip. Along the way, they saw emergency vehicles responding to the explosions. Boston’s climb from last place in the AL East in 2012 to the top of the baseball world was stunning. But not to Pedroia, a gritty leader of a closely knit team that won the title with a 6-1 victory over the St. Louis Cardinals in Game 6 on Wednesday night. It was the first time the Red Sox won the Series at home in 95 years. The line score from the clinching game was still on the scoreboard on the left-field wall as season-ticket holders gathered for a prerally ceremony. Then the team boarded 25 duck boats of many colors — pink, yellow, maroon, lime green, white and more — normally used for tourist trips. Some boats even had light brown carpeting cut into the shape of beards attached on the front. Players still had their beards, which some had grown all season long. “Hopefully, we can all get together and shave them for a good cause,” third baseman Will Middlebrooks said. Some fans also were at rolling rallies after the 2004 and 2007 championships. Anna Mitkevicius, 24, of Medford, watched from near the finish line that she never reached on April 15. She was stopped about one mile before the end because of the explosions. There was a very heavy police presence, with dogs and bullhorns. Crowds were about 15 people deep on both sides near the finish line on Boylston Street. Many wore Red Sox gear, some with foam beards and holding signs “Papi for Mayor,” a vote for World Series MVP David Ortiz. Steve Horgan, the police officer who raised his arms in a “V” when Tigers right fielder Torii Hunter tumbled over the bullpen wall in pursuit of Ortiz’s homer, rode in the lead vehicle with John Henry and other team owners. “A thrill of a lifetime,” Horgan said. 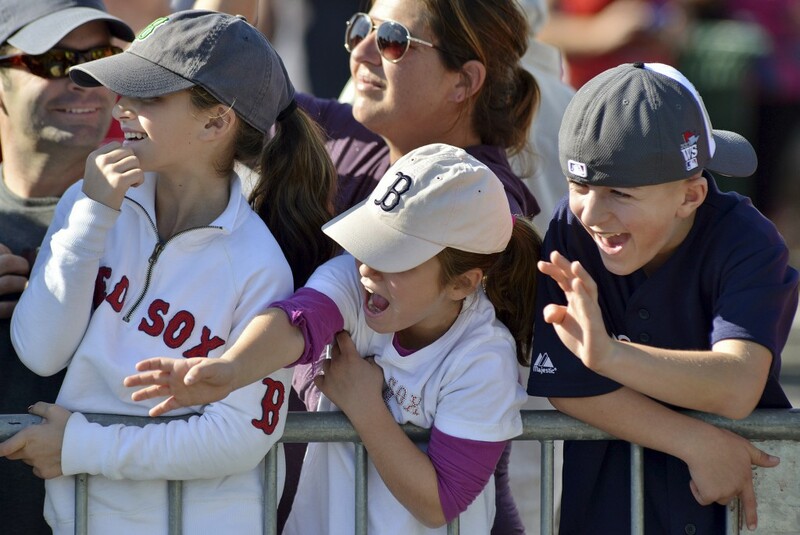 When the vehicles slid into the river — another big splash for the Red Sox — spectators cheered. 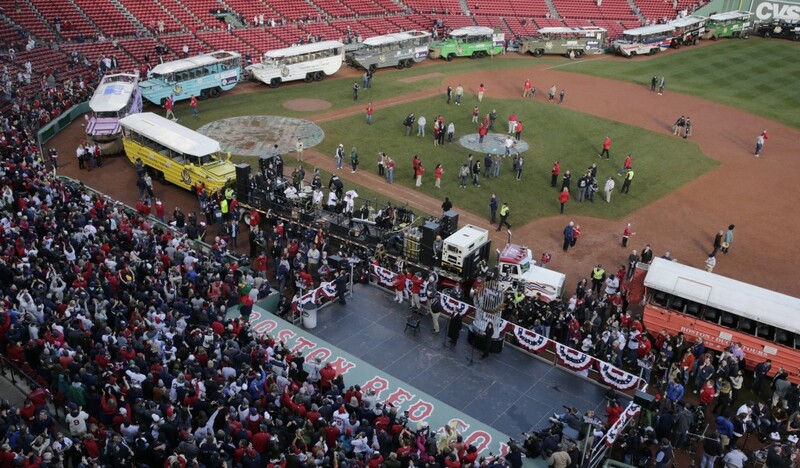 The departure from Fenway was delayed when a flatbed truck carrying Dropkick Murphys, a band which had played at the ceremony, and heavy equipment became stuck in the turf along the first-base line. A duck boat drove up in front of it and, with a tow rope between the vehicles, pulled the flatbed out of the ruts. Less than three hours later, the rally was over.